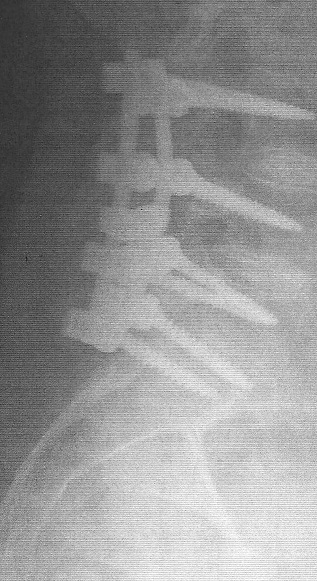 My lower back fusion surgery was Feb.3 (Monday). I got out of the hospital @ noon on Thursday. In order to go home, I had to satisfy the Physical Therapy Nazis. I was in dizzying pain even with the meds but of course, I was determined to get home. With walker in hand, I had to walk to China, down a ramp, and into the PT room. I had to climb into a mock tub and sit on the shower chair. Then I had to get out. It might not seem like much but I assure you, it was. Then I had to walk up 4 steps and back down. THEN, I had to walk back to my room – from China! I knew this was a serious surgery before it happened. These are 2 pics of the model in the surgeon’s office. 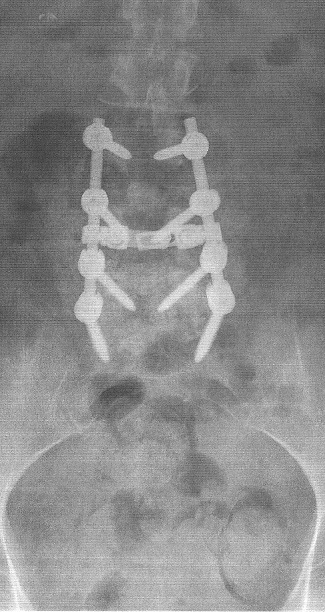 This surgery is an end-of-the-line option for lower back issues. I have had lower back issues since 1980. I worked in patient care for 9 yrs. (boarding academy & college). I kept the back muscles strong by sticking to a daily exercise regimen for 25 yrs. The last 5 yrs. of being bedridden caused the muscles to atrophy. Discs easily slip out of place or rupture, which happened to me last fall. My mother was here for 3 wks., thank God! I needed her medically and emotionally. I was a baby. When it was time for her to leave, I knew I was ready but I didn’t want to put the ‘big girl pants’ back on. I didn’t want to think about paying bills, school, making business decisions, being alone (especially at night), and being a grownup again. But I’m so grateful she took time away from her business and family to be here to meet my incredible needs. So here’s the reality after 4 weeks. The surgeon says he is pleased with the hardware position and recovery progress. I started physical therapy 3 weeks ago (2x/wk) and must do the exercise regimen twice per day. Most of the exercises stretch out the back/leg muscles. Yes, it’s painful but I know it’s necessary, if I want to heal correctly. The bars on the side running parallel with the spine are covered with a mixture of my bone marrow & donor marrow. My body seems to be accepting the mixture. So here is the ugly incision picture. Curtis took this 2 days ago at the 4.5 wk milestone. The 6inch ruler is for reference, above is the bottom of my sports bra. 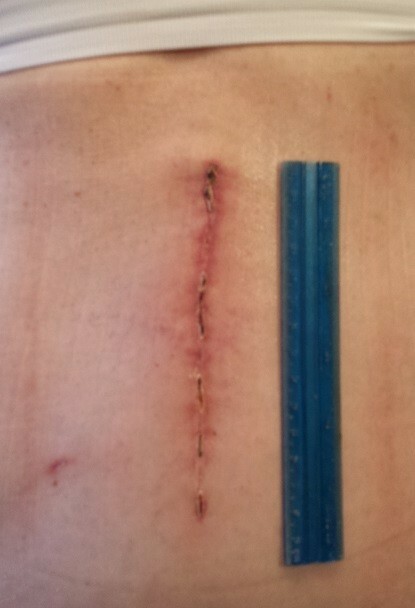 I had never seen what the incision looked like nor did I know its size until I saw the picture. I was SHOCKED! It looks angry and huge! I started crying. Curtis said, “Yep, that’s what we’ve been dealing with and it actually looks so much better than it did before.” Mother took care of changing the dressing until she left Feb19. Curtis took charge of dressing changes ever since. Boy, I’m a lucky girl! At Wednesday’s visit to the surgeon, he said the dressing should stay off since there is no longer any drainage. He also wants me to leave off the support belt as much as possible in order to strengthen my muscles. I still wear the huge, black support belt most of the time but try to do as much as possible without it. I will post more as I am able. Thanks for your prayers & for your continued interest. Sorry for the ‘ugly’ pic!